Tipperary County Council Chairperson, Mr Michael Fitzgerald, endorses Fairtrade Fortnight. 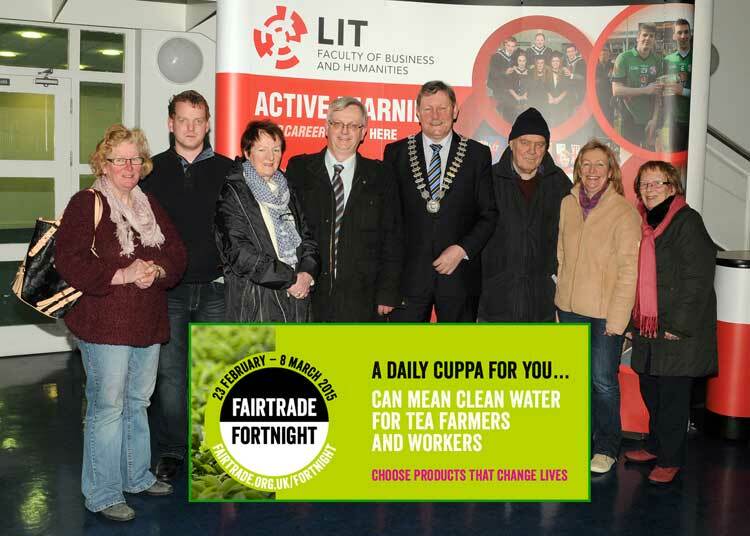 Tipperary County Council Chairperson, Mr Michael Fitzgerald has today endorsed “Fairtrade Forthnight” which begins on February 23rd and runs until March 8th 2015. “As an Cathaoirleach (Chairperson) of Tipperary County Council, it gives me great pleasure to support and endorse the concept of Fair Trade and I would encourage the population of Co Tipperary to please renew and continue their support for Fairtrade, particularly during the two weeks from February 23rd to March 8th, (2015) designated “Fairtrade Fortnight” and to ask all retail outlets to stock Fairtrade products. Cathaoirleach of Tipperary County Council, Michael Fitzgerald, (Centre), with members of Thurles Fairtrade Town Committee, (From Left), Kitty Scally, David O’Gorman (Student LIT Global Development Group), Mary Larkin, Gerard O’Hara, Noel Kennedy, Evelyn Nevin, and Nancy Tynan. By switching to ‘Fairtrade’ products for their regular shopping, involving items such as Teas, Coffee, Bananas, Cotton Goods etc., Tipperary people will make a real difference to small producers in other developing countries. Signed: Michael Fitzgerald (Cathaoirleach, Tipperary County Council). Please do support all Thurles FAIRTRADE FORTNIGHT initiatives, details of which will be announced closer to the event by Mr Martin Kennedy, member of the Thurles Fairtrade Town Committee. A gentle reminder folks, that we hope you will support Thurles Fairtrade and field a team in tonight’s Fairtrade Fortnight Table Quiz. Please call Noel Kennedy with any queries and to confirm your team on 087 921-2600. Spectacular Fairtrade hampers for each member of the first prize-winning team plus plenty of spot prizes. Field a team of four for just €20 and reserve a table. An enjoyable evening is promised with quizmaster Tom Noone presiding. Remember no specialist knowledge required! With Fairtrade Fortnight starting on Monday next, here in Thurles, here’s a reminder to think about fielding a team in their Annual Table Quiz. Their Annual Table Quiz is on Friday, March 9th at 9:00pm sharp, in Skehan’s Pub, Liberty Square. Spectacular Fairtrade hampers for each member of the first prize-winning team, plus plenty of spot prizes. Field a team of four for just €20 and reserve a table by calling 087-2624154. An enjoyable evening is promised with quizmaster Tom Noone presiding. No specialist knowledge required! Meet the Fairtrade Coffee Producer on Wednesday February 29th at 11:00am in the Tipperary Institute. Transition Year students from 4 schools have been invited to meet with guest Fairtrade coffee producer Sigfredo Benite, from Cooperativa Los Pinos, San Salvador. Fairtrade Promotion on Saturday morning March 3rd with Fairtrade information stand, free raffle and giveaways at the Thurles Farmers Market. Fairtrade supports local farmers – somewhere else! Coffee Morning hosted by Thurles Credit Union on Friday, March 9th 10:00am-12:00pm Nancy Tynan and Michael Harty look forward to welcoming you for a complimentary cup of Fairtrade coffee! For further information on Fairtrade Fortnight in Thurles, call the Secretary on (0505) 42570 or (087) 2624154. The FAIRTRADE Mark is an independent consumer label that you can find, as you go about your daily shopping, on over 75 branded products on sale here, presently, in Thurles. This mark acts as a guarantee that disadvantaged producers in the developing world are getting a fair deal for their produce. In order for any product to display the FAIRTRADE Mark, it must meet high international Fairtrade standards. Often people think that Fairtrade products are mainly just tea and coffee. Nowadays this is far from reality with cotton, flowers, wine and olive oil amongst the numerous Fairtrade products in Thurles shops. Producer organisations that supply Fairtrade products are inspected and certified by Fairtrade Labelling Organisations International (FLO). They receive a minimum price that covers the cost of sustainable production and an extra premium that is invested in social or economic development initiatives. These give people a chance to better their own living and working conditions. Asking local shops to stock Fairtrade products. Asking for Fairtrade tea and coffee every time you are in your local café/restaurant. Encouraging the company you work for to use Fairtrade tea and coffee. Expand your shopping list of Fairtrade goods to include bananas, chocolate, sugar, honey, dried fruit, snacks, juice, wine and gifts, to name a few. According to a new global survey of 17,000 consumers in 24 countries, which was conducted in 2011, Fairtrade International consumers across the world remain firm in their belief that their shopping choices can make a very positive difference for farmers and workers in developing countries. Contrary to what might be expected during the recession, Fairtrade sales continue to grow in Ireland. In 2010 consumer spending on Fairtrade Certified products grew by an impressive 17%, from €118 million in 2009, to €138 million in 2010. Ireland now has one of the highest per capita spends on Fairtrade Certified products anywhere in the world. Do you support Thurles Fairtrade? Volunteers taking part in the North Tipperary Volunteer Fair, held in Thurles Shopping Centre this evening, report the event as being an excellent public relations exercise for their various organisations. This event, which was funded by the European Commission, was successfully organised by North Tipperary Volunteer Fair Steering Committee, led by the Europe Direct Information Centre here in Thurles Library. Europe Direct Volunteer Fair from Rachel Willo on Vimeo. Hundreds of shoppers stopped off to the various stands, who proudly explained their goals and the magnificent work being carried out by each of the organisation represented. A wide variety of stands displayed their wares, including GIY, ICA, Thurles Fairtrade, Tipperary Regional Youth Service, Irish Girl Guides, Upperchurch-Drombane Development Association, Cabragh Wetlands, Irish Pilgrimage Trust, Rainbows, Thurles Toast Masters, Cava, An Taisce, Hidden Tipperary, St.Mary’s Famine Museum, Thurles Special Needs and many more. Other similar Fairs will take place this month in Damer Court Hotel in Roscrea on Saturday 23rd from 12.00-3.00 p.m. and Nenagh Arts Centre on Sunday 24th from 12.00-3.00 p.m.
Congratulations to Ann Marie Brophy, Executive Librarian, here at Thurles Library for her excellent organisation of this event and to the many who pledged assistance goes the thanks of the organisations involved.